Uganda has no street addressing (interesting right? ), but we have marked the locations for both the Stone Fruit House & Chalet on Google Maps. The Chalet in combination with several small cabins serve as accommodation for conferences, training programs, retreats, and weddings. 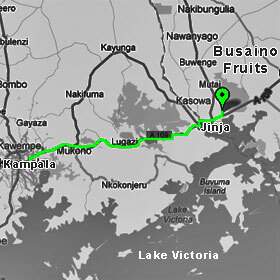 Because of it's proximity to Jinja, the Chalet also serves as our head office. There is excellent bus and boda-boda (motorcycle taxi) service to the Chalet. We also organize car and bus services for individuals and for large groups. The Stone Fruit House is more remote and this is certainly part of its charm. It can still be accessed via inexpensive public transportation, but we generally arrange for transport for guests to the Stone Fruit House grounds and facilities. A country drive lands you at the Fruit House. 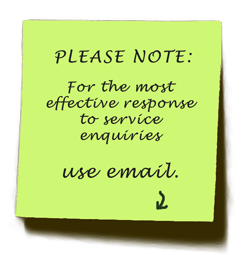 Some comments from our clients. I brought a group of permaculture students to stay and study at the Fruit House. They loved it so much that I will bring a new group of students next year. 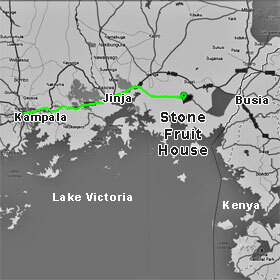 I stayed for over a week at the Fruit House and a few months at the Chalet because it was closer to Jinja's night life. As part of the volunteer program it was a great way for me to explore the Jinja area affordably, learn about agriculture and feel great about helping out. A quick drive finds you at the chalet.